Tag Archive | "Cook for the Cure"
Now in its 10th year, Cook for the Cure presented by KitchenAid is a program that gives people with a passion for cooking a way to support the fight against breast cancer. Through culinary-based fundraising, events, auctions and the sale of pink products, the partnership between KitchenAid and Susan G. Komen for the Cure® has raised over $8 million for the cause. “It adds another layer of purpose to one of life’s great pleasures, cooking and enjoying food with family and friends,” said Debbie O’Connor, senior manager of brand experience for KitchenAid. —Invite guests for an evening of appetizers and drinks. 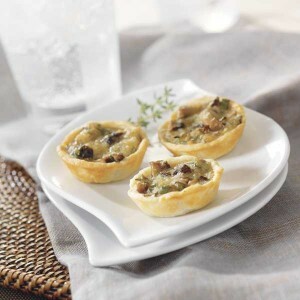 (Try these Mushroom-Onion Tartlets.) Encourage fundraising by awarding a prize to the guest with the highest donation. Or, let donors enter their name into a drawing to win a restaurant gift certificate or spa treatment. —Organize a fundraising bake sale. Get the neighbors involved in baking, promoting and selling — it’s a great way to bring everyone together. —Host a potluck brainstorming party. Invite people who share your passion for helping others to bring their favorite dish and think up creative ways you can support the cause as a group. Vote on a project and then let everyone pitch in to get started. Cooking good food, sharing time with friends, and giving back to the community — that’s a recipe for a truly great party. Learn more at www.CookfortheCure.com. Place cream cheese and 2 tablespoons butter in bowl of electric stand mixer. Attach flat beater to mixer. Turn to medium and beat about 1 minute. Stop and scrape bowl. Add 3⁄4 cup flour. Turn to low and mix about 1 minute, or until well blended. Form mixture into ball. Wrap in waxed paper and chill 1 hour. Clean mixer bowl and beater. Divide chilled dough into 24 pieces. Press each piece into miniature muffin cup (greased, if desired). Meanwhile, melt remaining 1 tablespoon butter in 10-inch skillet over medium heat. Add mushrooms and onions. Cook and stir until tender. Remove from heat. Cool slightly. Place egg, remaining 1 teaspoon flour, and thyme in mixer bowl. Turn to medium-high and beat about 30 seconds. Stir in cheese and cooled mushroom mixture. Spoon into pastry-lined muffin cups. Bake at 375°F for 15 to 20 minutes, or until egg mixture is puffed and golden brown. Serve warm.